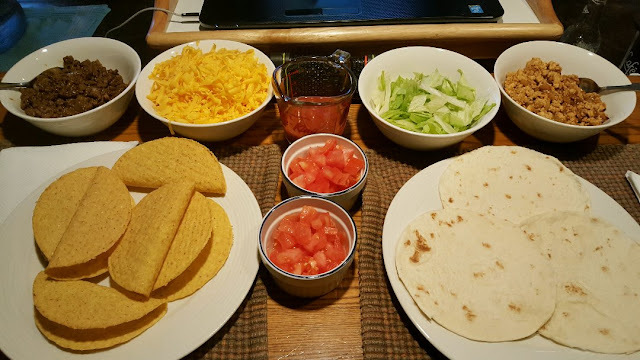 Last night was taco night! :) Alex made dinner, it was so nice not to have to cook yesterday, I am having some shoulder muscle issues. When we were digging the trench for the muddy driveway last week, I may have overdone, go figure...I always do! And I'm still sore from it. Yesterday it was so damp out and I felt it in my hands and knuckles too so Alex came to the cooking rescue. He makes beef tacos for himself and he makes chicken fajitas for me. We have so many leftovers, I think that might be dinner tomorrow! Well, I was right, the rainy weather has kept the weekenders at bay. I love how quiet the village is today! 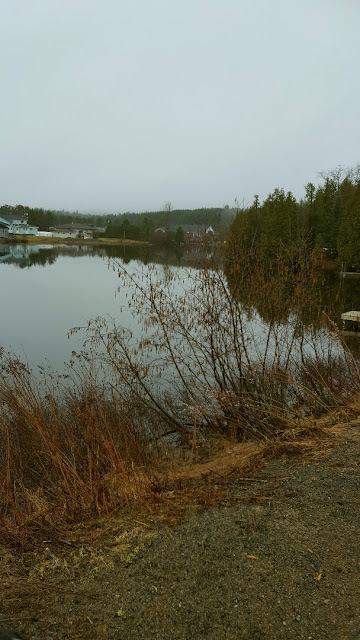 I was up at 7am and normally on weekends I don't walk the dogs because there is just too much potential for trouble with cars and quads everywhere and loose dogs to boot. But this morning, before I realized how quiet things were, I decided, the heck with it. I loaded up the car with the dogs, drove the 2 minutes to the other side of the village and walked them anyway. I'm SO GLAD that I did. I didn't bump into a SOUL on that side of the river. This will be a very good routine. If I can skip walking through the village to the river, I avoid the cars, quads, loose dogs and any other trouble that can happen. I know my dogs will protect me no matter what, but I need to feel comfortable enough to protect them as well. One of my neighbours mentioned a loose pitbull in the village last summer. That scares me. If any of my little ones got hurt, it would be horrible. But this seems to be a good solution, on the other side of the river, there are only a few houses, none of them have loose dogs. My fellow Canadian and Blogger friend Dianna, asked me to write something about how I do my Monthly Shopping and Meal Planning, how to get started and some tips etc...at first I was answering her in the comment section, but I realized it deserved its own page, so I wrote that this morning. I also put the link on my side bar in the section "Other Posts and Pages". For me, this is a life saver. After reading that page, you may find it a little overwhelming, but the whole point of doing a monthly shopping trip and meal planning is to reduce stress by getting it done once (or an added small trip for produce like I do now), being organized so you're not scrambling for dinner ideas, and eating with the seasons and what's on sale - THUS saving money on groceries. Not to mention saving wear and tear on the car, gas money, your time and your sanity! I hope my page helps a little! I say the drive is totally worth it. Taco night is good but really good when fresh cilantro is ready. I don't see snow in your photos! Mmm, tacos! I haven't made them in an age. In the summer when we have as many fresh greens from the garden as we can eat, I make us each a big bowl of greens, add all the taco toppings including the taco meat, and broken corn chips and that's often how we have "tacos." I wouldn't give that 2 minute drive across the village to walk the dogs a second thought at all. The cost of gas and/or vehicle maintenance isn't worth a hill of beans compared to the safety and mental health of you or your dogs. So there! Tacos are delicious. One of the nice things about where we now live is that tacos are something of an art form. I have been exposed to many sorts of tacos that I would not have otherwise thought of. Hiya! Oooh those tacos look delicious! I love tacos. Do you make your own taco seasoning? I have a recipe that I could share if you do not have. I refuse to buy a packet that is filled with salt and preservatives. Let me know! I think driving 2 minutes to a more quiet and more private area is the best thing you could do - both the safety of you and the pups and your sanity. When we first got Karma I took her to a local dog park to see if I could sensitize her to other people and dogs (her story is such a sad, sad one) but sadly it was our last trip there. Some idiot with a pitbull puppy (pitbulls are banned in Winnipeg so not sure how this one slipped by) but this puppy was not trained at ALL. Another lady walking her dog warned me about this dog owner and how irresponsible she was, so I took Karma down another path. Just my luck, the puppy followed. The woman tried to call the puppy back but nope, it was full on terrorizing Karma who was trying desperately to get away and I was trying desperately to pull that puppy off Karma. As the woman was coming up on us, I told her that she needs better control of her dog. She turned around and got mad at ME. Was yelling at me, calling me a b**ch and "f" this and "f" that to me. Karma was unhurt THANKFULLY and we managed to keep walking and get away from this lunatic and her puppy. Other people were coming up to me and asking if Karma was okay. I was shaking so bad I had to call my husband to come and get me. He was just coming back from the ranch and it was on the way home so he came and found me. So I understand your reasoning behind driving to where it makes sense. I would do the same thing. Makes perfect sense to me! Today I went with my son to IKEA. He needed to go and I went along. Well, I drove, bought him lunch and a bag of the famous IKEA meatballs but yeah :) Guess what I bought? I bought their mini indoor greenhouse!! It looked like a little Victorian one, complete with proper glass sides. In this I am going to grow lettuce year round. Its covered so the cats cannot get into the soil or eat the greens and a perfect size for staggering lettuce growing. I am totally stoked about this! :) I have to get some soil for this and I have seeds already. Oh and I need little pots too. Oh I am just so happy. And I justified spending money to save. Fingers crossed! You are simply THE BEST. 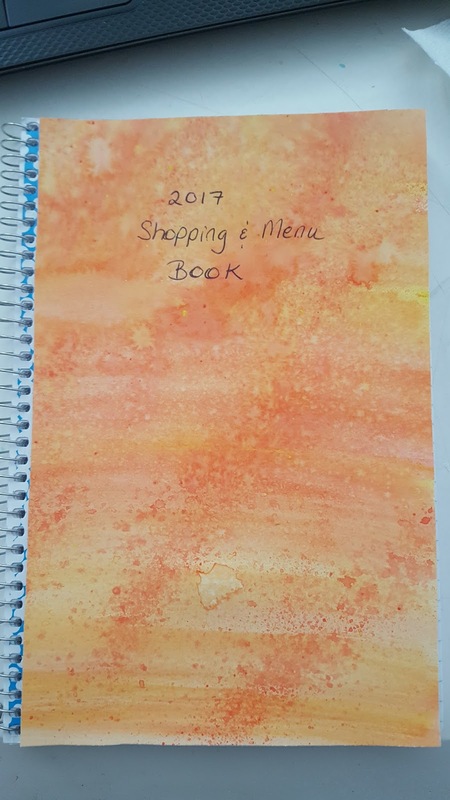 Thank you for posting about your monthly planning and shopping. I know what I am doing tonight! I am pretty sure it will take a couple months for me to get my thoughts organized and my plan in place but I am determined to do something better! I hope I can plan to do this monthly. Grocery shopping now takes me 2 1/2 hours every other week. And I do this right after work because when I get home, I never want to go out again. I am a total homebody! :) And anything that can help extra with my sanity is just an added bonus! Hubby's favorite meal is tacos. I can my own taco sauce and make the tortillas from scratch too. Golly, now I am craving tacos, ha ha! Love the photo with the dogs. We once had an older pitbull (rescue). He was like a baby. Never even chased my chickens or barn cats either. It's all about how they were raised. Hi Dianna :)) We're having the leftover tacos for dinner tonight! I use Old El Paso for the seasoning right now. I've tried to make my own but I never got it the way I like it, too spicy or too peppery. The packs I buy seem to be just right for me, but you're right they are filled with salt. I can't eat something too spicy or I get heartburn! Or worse, the food gets stuck and I regret it. Hi Kristina :)) I agree that all dogs should be judged by their owners. And I feel that way, my neighbour in Montreal had an old blind Bully and he was the sweetest little guy. The one roaming the village last summer charged at my 70-year old neighbour with her little Yorkie, so that one was known to be aggressive. It ended up being teenagers from another town who were at the river "sunning" and letting their dog do what it wanted. It's ALWAYS the owners. Hope you can have some tacos to ease that craving! :) We're finishing them up tonight! 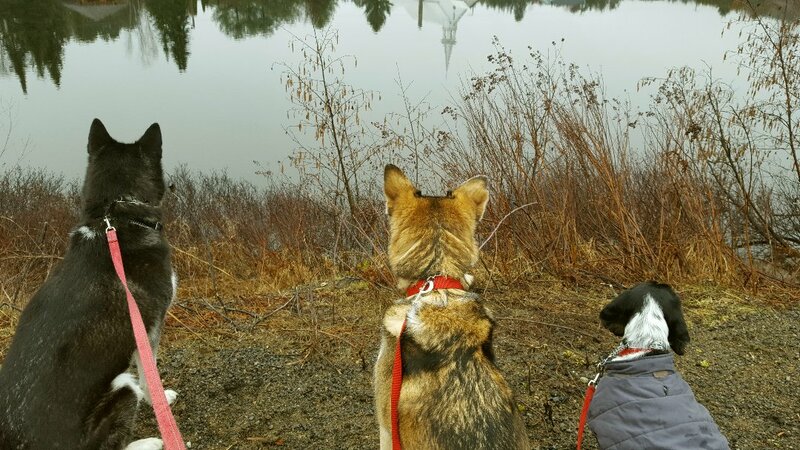 My dogs walk themselves. I have a nice sized piece of land, and I have national forest on three sides of it. No people anywhere around. When I go for a walk down to the waterfall, I always have my dogs come along. Less chance of me walking up on wild hogs or a bear that way. I remember a good many years ago reading about a hiker who was killed by a pack of coyotes in the very north of Cape Breton. I used to hike alone all the time actually and when I read that it kind of scared me, I lived in bear country back then. I do have an air horn for what it's worth. I'm envious of your land. :) Alex and I plan to buy in a few short years hopefully, and one of our requirement will be a lot of land as well. What a gift to be surrounded by national forest! We saw a place once that had crown land surrounding it, but it was out of our price range, we're always on the lookout though! Definitely going to have to make some tacos soon! Hi Leigh :) You and me both with that Mexican food love we have! :) Oh wait, I did make tacos lol ;) I'm having more tonight! Rain, thank you so much for taking the time and effort to write out your 'system'...I have my own but I go every 2 weeks but would like to narrow it down. I love that you were a financial manager....that is my weak spot. So, I try to work on my weak areas. I used to be very organized and being a computer person I love numbers and planning and being exact so your system with taxes included is great! I had a 'pantry' on my porch until it leaked so now I need to create a place to store it all. I usually have what I call 'backups'...when I'm out of something I have 1 more on reserve but the item goes on my list (yes, it's a magnetic whiteboard on my frig just like yours! LOL!) when the first one is used up so I am replacing my 'backup' product. Of course, it is non-perishables or items that can be frozen. I'm going to work harder at sticking closer to a food budget too thanks to you! This is so motivating for me as I have no one to talk about this stuff with except my wonderful blogging friends! And I guess I'm like you in that I work hard so I do not feel overwhelmed although it doesn't always work but I try! So glad I know you! P.S. I'm catching up on your posts as the last week has been sort of a blur...ha! Ha!